Our league has started up a small campaign recently thanks to the hard work of one member. Here's a look at the first game. First, a little background. For those who already know, we lean towards a little more casual type of gaming (read: they keep me happy and let me play how I want). We thought it might be cool to get a campaign going to give us a backdrop to play some games against for the next few weeks. Naturally, we gave the entire job to one guy so the rest of us could just show up and play without having to do any kind of work other than take pictures of our battles (and even I managed to mess that up). We were given a some history, a spot on a map, paired up with our first enemy and let loose. And I think that's pretty much where the structure ended for the most part. I almost feel bad for the Campaign master. It can be tons of work putting something like this together and we monkeys show up just to play and can't even get that right. Vacuna, once a thriving hive world on the Western edge of the Segmentum Ultima, was overrun by an Orc Waaagh! pouring out of the Ghouls Stars through the Gates of Varl. 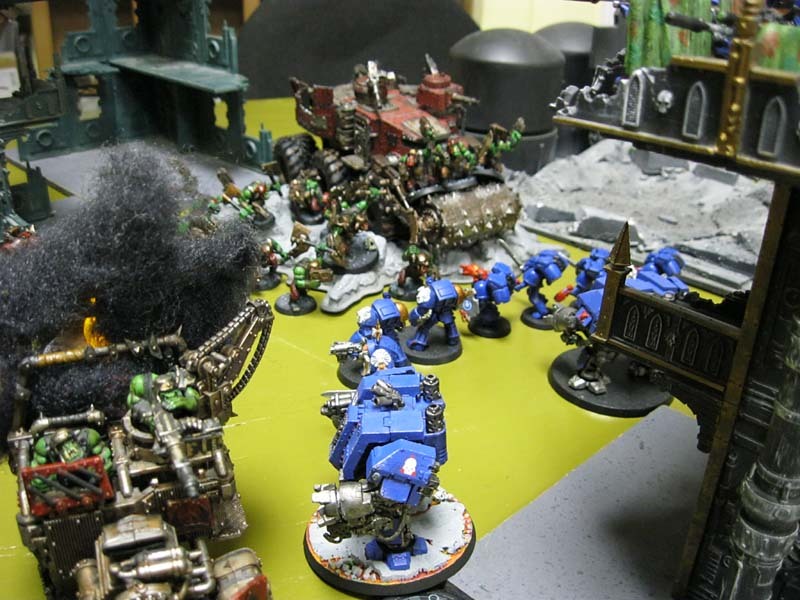 The Waaagh now threatens the Imperial Military world of Baal, home to the Blood Angels Chapter of Space Marines. The Council of Terra has ordered a task force be assembled and to retake Vacuna, driving the Orks through the Gates and back into the Ghoul Stars. Murmurings within the Warp also indicate that Vacuna may also have a more sinister presence. Since I don't currently have an army. I get to play whatever anyone brings in for me. This week, I was The Ultramarines. I was set up against the Orks in an attempt to slow down their spread for this round. I wasted no time in letting the Blood Angels player know I was there to save his homeworld for him. I also offered the Ork player the chance to concede and save himself the disgrace of being beaten into the ground without mercy on our first game. I figured it would be the right thing to do. He elected to play it out though. We were given 1500 points each and the Ork Cut and Run Battle Mission. I had about 1400 points so I made up the difference by adding wargear as I needed it as I went along in the game. That and playing WYSIWYG. If A guy had a power sword in his hand, he had one in the game. NOTE: I'm really digging the whole WYSIWYG thing... give a guy a power weapon and voilà, instant power weapon in a squad! That last bit worked against me because I really could have used a chainfist at one point, but didn't have one handy. Maybe next time. Stupid Ork Battle Wagon thing with a huge roller on the front kept coming for me. I've taken the time to break down some of the finer points in our game. 1. This dreadnought spent most of the game right here. As soon as he crushed the Ork Trukk, they got out and promptly immobilized him. We weren't sure if he could pivot in place to shoot his guns (being that he was immobile), so I spent a few turns facing that one direction and then a few pivoting in place to get better shots once we found a rule that seemed to suggest I could. 2. I tried my hardest to get this monstrosity damaged by difficult terrain. Is it one or two dice that you roll? I think it's one for dangerous terrain and two for the distance you can move in Difficult terrain right? We weren't sure. 3. This is their disembark move. Not quite two inches, but close enough. What can you do when you have a few hundred Orks getting out of their trukk? 4. I didn't notice until after the first few rounds of combat that one of these guys had what looked like a power sword and not just a chainsword. That helped for a round until he got swamped in combat. Might of helped earlier had I noticed. 5. This guy got into hand to hand combat and ended up having both arms torn off. We knew he went down to one attack each turn and had his strength reduced, but I later learned it also affect how the Orks hit him too. The Orks never did kill him... of course he didn't do much to them with both arms gone either. Next week, I should face off against Deamons. We'll see how that goes. er...wait thats wrong (having just double checked). ignore 'for every 6" it moves in terrain'. They roll one dice for terrain no matter how far they move. whoops. I was afraid we were playing it wrong. We were close though and i think I would have let him have it anyway just to see how it would have played out... especially if I had that chainfist I so desperately wanted. I can't believe you don't have an army. You run From the Warp and you're always painting stuff. I also can't believe you don't always play WYSIWYG. I've been playing that way since about 1996 it solves problems and stops arguments. Especially back in the day of war gear cards. Muskie: Hey wait a minute... I do have an army. It just happens to be in the box still on the sprue. I see no need to dwell on the particulars. But I do like WYSIWYG. I like it even more when I try to type it out and I have to hold down the caps lock button with one hand. And it is true, I am always painting stuff. Just not my stuff. 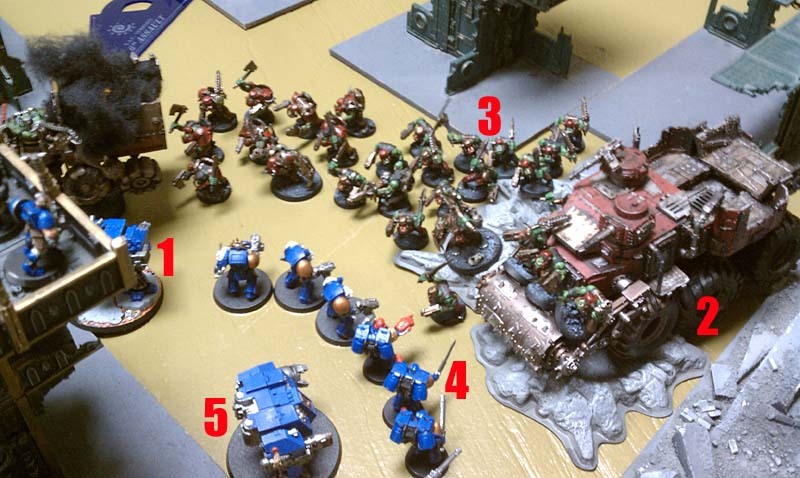 In regards to number 2, an ork vehicle with a deffrolla or a re-enforced ram gets to reroll its dangerous terrain roll. I like how you guys play by loose rules, sounds like a bit more fun then having people rule checking something obscure every 15min. HatesGravity: It's very much a "go with the flow" kind of game unless it has the potential to change the game completely and then we try and look it up. I know that if I can't find it right away, I'll just go along with whatever seems right or makes sense based on another rule we both know.